In a year filled with high-profile cruise ship mishaps, lawmakers are now turning their attention to the amount of crime that takes place while vacationers are out at sea. NBC’s Mark Potter reports. >>> to the trouble waters the cruiseship industry where consumer confidence has dropped 12% in the last year. a year filled with fires, accidents and health threats finally forcing lawmakers to hold them better accountable. >> reporter: since the crash of the cothat concordia last year, cruiseship fires and power outages have grabbed headlines worldwide. now the issue of crime against passengers is drawing the attention of the senate. >> cruise lines are on notice that the safety of and protection of the passenger is their number one priority. >> reporter: according to the committee report, the number of crimes is 30 times more than those reported publicly. the report says, since 2011 , cruise lines have reported 959 and crimes to the fbi while the coast guard reported only 31 alleged crimes publicly. >> it lulls families into a false sense of security and come place ensy when they should be on a heightened awareness. >> but only those crimes actually solved by the fbi must be reported. not reported are crimes against children, including sexual assaults . >> close to 18% of the victims of sexual assaults on cruiseships are children. >> when there's a crime on land you call 911 and the police come to investigate. when it's on cruiseship, you report it for the security officer who works for a cruise line which may have an interest in protectingist. a cruise passenger protection act has been proposed requiring that all crimes be made public. 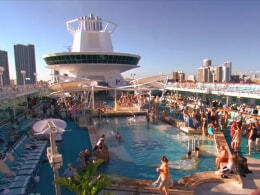 the cruises line industry says the rate of crime on cruise ships is substshlly lower than corresponding rates on land. and now the three biggest cruises lines are promising to post their crime data voluntarily starting next month.